Unprotected utility boxes are an open invitation to thieves and vandals who can wreak havoc on your systems, causing thousands of dollars in damages and repairs. 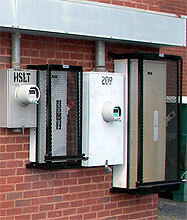 Thieves break open utility boxes to take copper and brass wiring and fittings. Vandals get their thrill by pulling main power handles in the middle of the night. Both situations leave you to find thawed freezers and systems down due to power outages in the morning. The cost to repair and replace lost wiring, damaged goods and electrical systems can run into the thousands. Why not prevent this from happening in the first place? 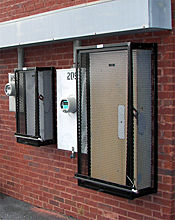 Constructed of 1/2" x 13 gauge expanded metal panels framed with 1" x 1/8" steel angle edging, this sturdy security cage protects your utility boxes and important systems from the ravages of theft and vandalism. Each cage is custom built to fit your utility box dimensions and mounts directly to the building structure.The cage front swings open on hinges for maintenance access but locks securely at cage side for theft and vandal deterrence. The attractive finish is due to smoothing of welds after construction and then priming with powder coat paint and giving the cage a final coat of black powder coat paint. When appropriately secured with a padlock, this cage is extremely difficult to break into. The steel mesh is sized so that metal cutters can't get a strong enough hold on the mesh to be able to cut through it. The 1" wide steel frames are welded at corners and to the steel mesh, and all fasteners are welded to the inside of the cage, making it virtually impossible to disassemble the cage from the outside. With so many deterrence factors in place, thieves and vandals will move on to easier pickings rather than spend extra time and risk preying on your facilities.